Dining out for Easter 2019? It’s this coming Sunday; here are some restaurant and food vendor highlights for Santa Cruz, the South Bay, and San Francisco. I’ll post some more in the next couple days. The Chaminade offers its annual Easter Brunch Buffet from 9 a.m.-3 p.m.; the price is $65 (adults), $20 (kids 6-12), and free for kids under 6. Selections include fresh carved prime rib and leg of lamb, a seafood bar, omelets made to order, a devilled egg trio, a Mediterranean mezze display, several salads, and desserts such as Easter specialties and pastries. There will be hourly Easter egg hunts for the kids between 10:30 a.m. and 2:30 p.m. – these are open to restaurant and hotel guests only. Call (831) 475-5600 for reservations. Visit chaminade.com. The Hilton SV offers its annual Easter Brunch Buffet from 10 a.m.-2 p.m.; the price is $35 (adults), $19 (kids 6-12), and free for kids under 6. Selections include roasted herbed turkey, a carving station with honey glazed ham, a smoked salmon platter, Belgian waffles with berry compote, chicken apple sausage, an omelet bar, and desserts including a shortcake bar and cinnamon apple bread pudding. There will be Easter egg hunts at noon and 2, and an appearance by the Easter Bunny. Call (831) 440-1000, ext 4 for reservations. At the three Manresa Bread locations (Los Gatos, Los Altos & Campbell), a few special dishes are available for Easter feasts. Guests can pre-order partner/head baker Avery Ruzicka’s seasonal strawberry apricot Panettone, fig walnut or chocolate Babka, and tomato and asparagus quiche, to pick up at the bakeries between April 19-21. For advance orders, visit pre-ordermanresabread.com. Additional treats are available at the two bakeries (276 N Santa Cruz Ave, Los Gatos, and 271 State St, Los Altos) and the one all-day café & bakery (Campbell, 195 E. Campbell Ave.) during Easter weekend. For Easter brunch April 20, Manresa Bread Campbell will add dishes such as burrata and asparagus toast, vegan vegetable soup, and doughnuts. Visit manresabread.com. At Porta Blu there will be an “Easter Brunch Bash” from 11 a.m. to 2 p.m. Bay Area native / Chef de Cuisine Michael Riddell, has created a menu with dishes such as Lemon Pancakes, Rosemary Ham Benedict, and Dungeness Crab Toast. Families are invited to indulge in a gourmet spread of dishes, snap a photo with the Easter bunny, grab a basket for the egg hunt, or play in the petting zoo. Porta Blu’s weekly jazz brunch series will continue on Easter, with live music provided by local saxophonist Michael O’Neil. For reservations, visit portablurestaurant.com. An artisan chocolate leader for over 20 years, Recchiuti Confections is known for meticulously sourcing ingredients and hand-crafting their recipes in small batches using traditional European techniques. Store locations are One Ferry Building, Shop #30, and 801 Twenty-second Street. Visit recchiuti.com. The below items are available both in store and online. Nestled in the heart of San Francisco’s iconic Presidio National Park, Presidio Social Club (563 Ruger St.) is a former military barrack turned modern eatery paying homage to its historical past by celebrating classic Americana cuisine and a completely in-house maintained barrel-aged cocktail program. 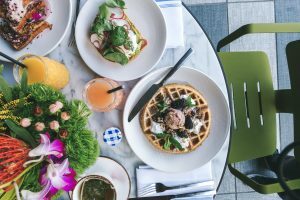 Presidio Social Club invites families to enjoy Easter Sunday Brunch between 9 a.m. -3 p.m. either indoors or on the restaurant’s tree-lined open patio (dependent on weather). They will offer both classic and specialty a la carte menu items such as those listed below. Visit presidiosocialclub.com. Reservations can be made via OpenTable. Celebrating “Chicago-style cuisine with an emphasis on authenticity and quality ingredients,” Capo’s owner Tony Gemignani invites guests to experience a traditional Italian Easter dinner with classics such as his Stuffed Crust pies. Originally derived from the traditional Italian Easter pie, Scarciedda, Capo’s offers stuffed pizzas like the Big Jim, Old Chicago, and Frank Nitti. If you’re looking for a special Valentine’s Day gift for someone who takes their home coffee and breakfast making seriously, I got to sample some Hamilton Beach products recently and can tell you about a few. Hamilton Beach products are generally available online at hamiltonbeach.com, Amazon.com and at select retailers. First, the FlexBrew Coffee Maker, which is a combination of Single Serve and Full Coffee Pot. If you want a full or half pot of coffee, use the traditional glass carafe. If you want a single cup, use the other side of the machine with either K-cups/pods or ground coffee, depending what size cup you’re looking for. It’s very convenient to have all these options; my family has used all three in the few days since we first got the machine. It retails at $89.99 and can be found at the aforementioned places plus Walmart. 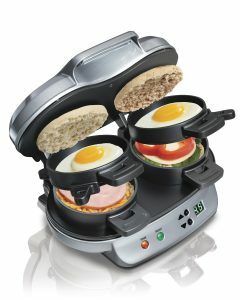 Next, the Double Breakfast Sandwich Maker, which allows you to make quick-yet-delicious customizable breakfast to enjoy at home or on the go. You choose your bread and add ingredients like eggs, cheese, precooked meat, avocado, vegetables, etc. If you need sandwich inspiration, there are enticing recipes on the company’s site like Avocado, Egg White & Swiss Cheese Breakfast Sandwich (see below for one more). You can cook two breakfast sandwiches in five minutes or less, and then cleanup is easy because the removable parts are dishwasher-safe. In addition to Hamilton Beach’s site and Amazon, this one’s available at Target. Cost is $39.99. Last but not least, the Belgian Style Flip Waffle Maker — which as of early February was out of stock on the HB site, but is often available at Walmart or Amazon ($39.99). You can change the browning setting depending how light or dark you like your waffles, and because of the “Flip” style, it’s easier to make thick, fluffy waffles like you find at restaurants. There are easily accessible recipes for traditional buttermilk waffles and unusual spin-offs like Tater Tot waffles (yes, ingredients like 40 thawed tater tots play a part in this concoction!). No matter what you choose to buy your Valentine—or yourself—for the occasion, I hope it’s a happy one for all you foodies and home chefs out there. Preheat Breakfast Sandwich Maker until green PREHEAT light comes on. Lift cover, top ring and cooking plate. Place bottom half of croissant, cut-side up in bottom ring of Breakfast Sandwich Maker. Top with cheese, apple slices and bacon. Lower cooking plate and top ring. Add egg to cooking plate. Top with remaining croissant half, cut-side down. Close cover. Cook 4 to 5 minutes. Slide out cooking plate by rotating handle clockwise. Lift cover and rings; carefully remove sandwich with plastic spatula. Test Kitchen Tip: For a lightly browned croissant top, cook the egg in the top ring without the croissant for 3 to 4 minutes or until egg is just about done. Lift the cover, add the croissant and continue cooking until top is lightly toasted and egg is cooked. 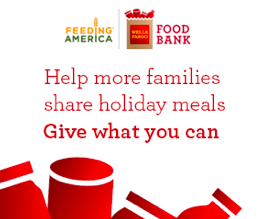 I recently discovered Wells Fargo Bank has donated $4 million to Feeding America, and announced they are matching up to $1 million in additional donations (that come from ordinary people like you and me) through Dec. 31, 2018. Even if you can’t donate much, every single dollar helps. And with Feeding America, $1 equals 10 meals. You can donate at a local Wells Fargo bank branch (even through the ATM) or donate online. The money will be matched, and for those donating in Santa Cruz County, it will be given to Second Harvest Food Bank (the first food bank in California and the second oldest in the nation). I love the fact that more than 60% of the food Second Harvest distributes is fresh produce! I learned that on the web site, in addition to being reminded that Second Harvest reaches 55,000 people each month. These are kids, seniors, veterans, homeless, and others. I hope you join me in supporting this important cause! Two weeks ago I posted this article with eight different “gift card bonus offers” from Santa Cruz and Capitola restaurants. Here are a few more for any of you doing very-last-minute shopping. Sushi Garden is offering 10% off if you purchase at least $50 worth of gift certificates. 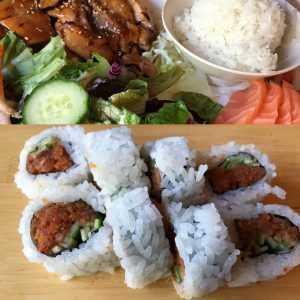 You have to buy them by Dec. 24, and they’re valid at all three locations: Capitola (820 Bay Ave.), Scotts Valley (5600 Scotts Valley Dr.) and Watsonville (1441 Main St.).Visit sushi-garden.com. Jamba Juice is offering a gift card deal this holiday season, through Christmas. If you buy $25 in gift cards, you get a $5 bonus card redeemable in January and February. For more information, visit jambajuice.com. Local stores include Capitola (3555 Clares St.), Santa Cruz (1550 Pacific Ave.), and Scotts Valley (214 Mt. Hermon Rd.). At Blaze Pizza (1901 Mission St.), if you buy a $25 gift card by Dec. 31, you get a free pizza reward to use at in 2019 (Jan. 1-Feb. 28). Restrictions: You must be a Blaze Rewards member (but it’s easy to sign up). For more information, visit blazepizza.com/locations/santa-cruz. And finally, even though it’s not food-related, I have to mention Bookshop Santa Cruz because it’s such a wonderful, independent resource—and it’s been so for more than 50 years! Through the holiday season, you receive a free $10 BSC gift card when you purchase four $25 gift cards, or a free $5 gift card when you purchase five $10 gift cards. Speaking of food, your gift recipients (or you!) can buy a cookbook or a different type of food book (Ruth Reichl’s Comfort me With Apples…Anthony Bourdain’s Kitchen Confidential, etc.). Visit bookshopsantacruz.com. Best wishes for a great 2019! Have some last-minute holiday shopping left to do? If any of these gift recipients are amateur chefs or just plain foodies, Cuisinart has a few gift ideas. Retailers that carry some of these selections include Bed Bath & Beyond, Kohl’s, Williams Sonoma and Walmart. First, the Air Fryer Toaster Oven, which was released in 2017. This product is a full-size toaster oven with a built-in air fryer. It bakes, broils, and toasts, AND it allows you to air fry inside the oven. Curious about air frying? 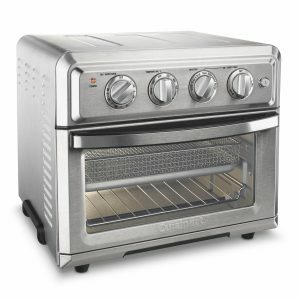 This is from Cuisinart’s web site: “Air frying, which uses powerful ultra-hot air, is a healthier way to prepare delicious fried favorites, from wings to fritters to fries to shrimp.” The product’s interior is large enough to “…air fry up to three pounds, toast six slices of bread, or bake a four-pound chicken or 12-inch pizza.” Retail price is $199. See below for a three-ingredient “Airfried S’Mores” recipe. Also visit Cuisinart’s online recipes for more. Cuisinart’s eight-cup food processor, originally released back in 2014, is stainless steel and retails at $99.95. The company kindly sent me a sample—I love the shape and size (different than my previous one, which I used religiously for years!). Also, I appreciate that the parts can go into the dishwasher. The last thing I want to do after spending a bunch of time cooking is then using more time washing dishes by hand! I know that many people have two food processors, so that they can use a smaller one for things like pesto and light chopping needs. If you know someone who cooks a lot, that already has a large processor, I would consider this four-cup chopper/grinder. It’s only $39.95 and it apparently comes with a handy recipe book (I don’t have one personally, so I can’t vouch for the recipes). If you’re looking for bakeware, I’ve found Cuisinart’s line to be highly dependable. Actually, I like using the mini heart pans to make savory dishes as well as sweet ones. I often make egg bakes in a glass baking dish or mini-muffin pans, and then save some of the batter for one of the mini hearts. It’s fun to surprise my 7-year-old daughter with a heart-shaped concoction. My latest was simple, with egg, chicken sausage, onion and a topping of shredded cheese, but it did the trick! I have also used my “easy-grip” non-stick 17-inch baking sheet with silicone grip handles ($23.95) for successful cookies and equally successful sheet pan dinners. Put 8 graham cracker squares on the AirFryer basket. Place a chocolate square in the center of each cracker and top each with a marshmallow. Put the basket in the upper position. Set to AirFry at 350 degrees F. AirFry for 3 ½ to 4 minutes, or until the marshmallows are lightly toasted. Carefully remove from the AirFryer and transfer to a plate. Top each with the remaining crackers. If you’re in Santa Cruz or Capitola and have some gift or stocking stuffer shopping to do, you’ll be happy to know that several restaurants are offering “gift certificate bonus deals” for the 2018 holiday season. Here are a few options – if you hear of any more, let me know at tara@santacruzfoodie.com so I can share with everyone, thanks! 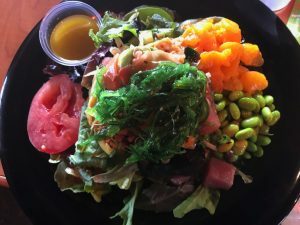 Pono Hawaiian Grill (120 Union St.) – If you buy a $25 gift card, it costs $20. If you buy a $100 card, you get a $20 bonus certificate. The offer is valid until Dec. 31. For more information, call 831-426-7666 or visit ponohawaiiangrill.com. Hula’s Island Grill: ((221 Cathcart St.): Purchase a $50 gift certificate and get a $10 card free to keep for yourself. Purchase $100 and get a $20 certificate free. Offer available until December 23. For more information, call 831-426-4852 or visit hulastiki.com. Mission Hill Creamery (1101B Pacific Ave., 831-216-6421) is offering gift cards at a 20 percent discount. Purchase cards such as a $10 card for $8 or a $50 card for $40. The promotion is valid through Dec. 24. Visit missionhillcreamery.com. Woodstock’s Pizza – Now through Christmas, for every $50 in gift cards you purchase, you get 5 free “Woody Bucks.” The Santa Cruz location is 710 Front St. Call 831-427-4444 or visit woodstockscruz.com. Denny’s: customers who buy a $25 Denny’s gift card will receive $50 in coupons for future visits. The offer is valid through Dec. 25. The Santa Cruz location is 1515 Ocean St. Call 831-426-4628 or visit dennys.com. Chili’s – If you buy $50 in gift cards, you receive a $10 bonus card to keep for yourself. The Capitola branch is at 1855 41st Ave. For more information, call 831-462-1813 or visit chilis.com. IHOP – If you buy a $25 gift card, you receive a $5 bonus coupon. The Capitola branch is at 1549 41st Ave. For more information, call 831-475-0540 or visit ihop.com. Happy holiday shopping & Bon Appetit! 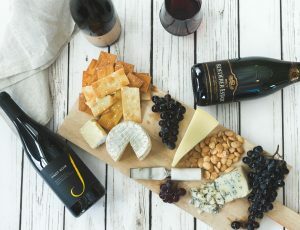 Whole Foods Market’s favorite local wine and cheese pairings for the holidays. Courtesy of WFM. Thanksgiving is almost here, and after that Hanukkah is right around the corner! Whole Foods Market locations in Capitola (1710 41st Ave.) and Santa Cruz (911 Soquel Ave.) have many Thanksgiving selections and several Hanukkah items, and they graciously gave me a gift card so that I could try a few out. You can place orders in person or online. Thanksgiving pick up dates are through Nov. 23; Hanukkah pick up is Nov. 30-Dec. 9 and selections include wine-braised brisket dinner for eight, and potato latkes with applesauce. Thanksgiving choices at WFM (see a holiday showcase here) include a classic roast turkey dinner for eight (with optional organic turkey upgrade) with a fully-cooked bird, herb stuffing and mashed potatoes turkey gravy, cranberry orange sauce, and green beans with crispy garlic and parsley; spiral-sliced ham; vegan entrees and sides; traditional holiday sides; and desserts. Prime members get a special deal: through Nov. 22, they get organic whole turkeys for $2.99/lb. and whole turkeys for $1.99/lb. Something new and intriguing is a vegan holiday meal WFM has created in partnership with award-winning chef Jeremy Fox, author of the “On Vegetables” cookbook. The meal includes Romanesco Cauliflower Roast with Miso Bagna Cauda, Cremini Mushroom Stuffing with Kimchi, and Roasted Acorn Squash with Maple and Hazelnut Dukkah. You can also order these selections a la carte. WFM is also offering a special seasonal pie from Lisa Ludwinski, founder of Detroit’s Sister Pie and author of “Sister Pie: The Recipes & Stories of a Big-Hearted Bakery in Detroit.” The Cranberry Crumble Pie, Ludwinski’s personal favorite for the season, features an all-butter crust, a sweet cranberry compote filling with juicy whole cranberries, grated pear and warm spices, and an oat crumble topping. Crab season is a Bay Area holiday tradition. Pick up at least three sweet and rich whole crab, and save $1 per pound. WFM’s team of local fishmongers will crack and clean free of charge. “Pick up your cut at the meat counter, pop into the oven and you are ready to serve your guests,” shared a WFM spokesperson. Tsar Nicolai sustainably raises and produces top of the line caviar in Wilton, CA. This year, WFM is partnering with the brand for an exclusive trio bundle deal, available in the Seafood dept. Whole Foods Market Santa Cruz is at 911 Soquel Ave. Call (831) 426-9901 for more information. Whole Foods Market Capitola is located at 1710 41st Ave. Call (831) 464-2900 for more information. For more Whole Foods Market locations, see the store locator. Halloween is fast approaching—here are a couple treats and tools for those looking for shopping and/or baking ideas. 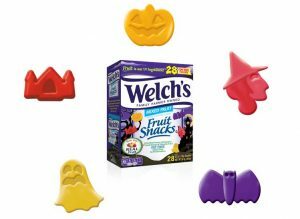 Welch’s Halloween Fruit Snacks: Welch’s created a special fruit snack package just for Halloween: the fruit snacks are shaped like pumpkins, castles, witches, bats and ghosts. The individual pouches are .5 ounces, smaller than standard ones, so they’re a nice change for giving out to Trick-or-Treaters or just giving to your own kids at home (and I must admit, I have enjoyed them personally—these aren’t just tempting to children!). They are “mixed fruit flavor” and come in 28-pouch boxes. Looking for a store that carries them? Visit the Welch’s Fruit Snack online finder. Hershey’s Halloween: this year, Halloween- or fall-themed products from Hershey’s include pumpkin spice kisses, cookies ‘n’ creme skulls, and Reese’s peanut butter pumpkins. Learn more at hersheys.com. Chicago Metallic’s Ghost/Pumpkin Silicone Mold ($19.99 on Amazon.com) enables you to bake or mold 12 small desserts or individual servings. You can use fun Halloween shapes and it’s great for mini cakes, brownies, marshmallows, gelatin, ice cubes, and more. Recipes included. The 14th annual “A Taste of Santa Cruz,” at the MAH from 5-8 p.m. Thursday, Oct. 18, features about 20 participating restaurants and food vendors plus several wineries and one brewery. This year, organizers switched the celebration from November to October and moved the time earlier, to take advantage of warmer weather. The event benefits first-time home buyers. Tickets are $50 in advance or $55 at the door if it’s not sold out. The cost includes a commemorative glass plus tastings from all vendors. Participants will have the opportunity to sample lots of food and drinks including a new raw oyster bar on the third floor (the refreshments are spread across all three floors, and there’s a wine bar at the museum’s outdoor sculpture garden where attendees can purchase extra glasses of wine). Buy tickets online, and visit atosc.com or call 831-464-2000 for more information. 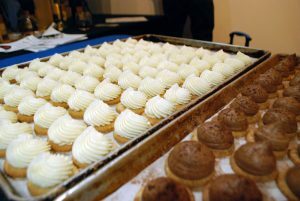 Food vendors include Splash!, Five Star Catering, Aldo’s, Rosie McCann’s, Gordo Gustavo’s, Casa Nostra, East Side Eatery, The Jerk House, Hula’s Island Grill, Percy’s Pies, burger, Woodstock Pizza, H&H Fresh Fish Co., Shucked Raw Oyster Bar, Vinocruz, The Turkey Boat, Buttercup Cakes, Nothing Bundt Cakes, Marini’s Candies, and Back Nine Bar & Grill. At the 2017 event, Splash! offered a tasty bite with house-smoked trout and tomato confit; Hula’s served up a delicious Hawaiian Ceviche (fresh whitefish cooked in citrus with coconut milk, chili, cilantro, and garlic), and Buttercup handed out their always-fantastic cupcakes. Wineries include Alfaro Family Vineyard, Kissed by an Angel, Stockwell Cellars, Bargetto, Roudon Smith, 37th Parallel, DeVincenzi Cellars, McHenry Vineyard, and Loma Prieta. East Cliff Brewing Co. will be providing beer. This year’s event is at the Santa Cruz Museum of Art & History for the second consecutive year, and Habit for Humanity Monterey Bay is a presenting partner for the second year in a row. There will be live and silent auctions. Live auction items include an eight-day unique Hawaii vacation that includes three different places to stay, a Jeep rental, restaurants, beach adventures and a massage. Silent auction items include wine tasting, and excellent tickets to the first 2019 pre-season game for the San Francisco 49ers. All proceeds from the event benefit the grant assistance program of the Santa Cruz Association of Realtors Housing Foundation, which provides closing costs for first time, low-income home-buyers in Santa Cruz County. In 2017, the event sold out—for the first time ever!—and raised nearly $25,000. The Taste of Santa Cruz has raised almost $400,000 since its inception in 2004. New Leaf Community Markets in Santa Cruz has lots of interesting cooking classes in the near future, including classes on making miso and paella, beer tasting and beginning home brewing with two local breweries, and learning about anti-inflammatory eating. Here are some details; these are all at the Westside Santa Cruz location at 1101 Fair Ave. (831-426-1306). Preregistration is required at newleaf.com/events. Friday, Sept. 21, 6-8 p.m.
You may have heard that inflammation is the root cause of all disease, but did you know that what you eat has a profound effect on feeding or fighting the issue? This class offers an intro to New Leaf’s 4-Week Anti-Inflammatory Integrative Wellness Series, held during the month of October. 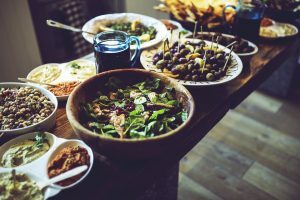 Come to this Dinner Party to learn the basics of anti-inflammatory eating, get your questions answered about the upcoming series, and meet past attendees who have benefited from this particular diet and lifestyle. Class will start with an introduction to “What is inflammation?” and include the topic of Leaky Gut, as well as a breakdown of anti-inflammatory eating. A full anti-inflammatory meal is included. Tuesday, Sept. 25, 6-7:30 p.m.
With Masumi Diaz and Eriko Yokoyama, founders of Hakouya Cooking School. In this class you’ll learn how to make 1.5 lbs. of organic miso to take home. Masumi and Eriko will share different ways to incorporate miso into your everyday diet. Since this is a simple but lengthy process, ingredients will be prepared for you in advance and assembled together in class. Thursday, Sept. 27, 6-8 p.m. In this hands-on class, Kristen Valenza will show you how to prepare traditional paella, and pair it with a Spanish red blend. Traditional paella is a mix of spanish rice, vegetables, meat, (like chorizo and sausage) and seafood, (clams, mussels, shrimp) and aromatic spices including parsley and saffron. Wine pairing included. Friday, Sept. 28, 6-8 p.m.
Julie Reinhart from Elkhorn Slough Brewing and Emily Thomas from Santa Cruz Mountain Brewing will lead you on an evening of beer tasting and beginner home brewing. They’ll go over different beer styles and you’ll get a chance to taste beers from both breweries, along with tasting notes.